Born: 1 October 1866, Staffordshire, United Kingdom. Died: 27 March 1913, Johannesburg, South Africa. Tom Johnson was educated privately and later acquired various certificates in steam, mechanics, drawing, and mining engineering, including the British Mine Manager's First-class Certificate (1892). 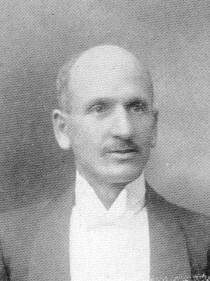 He was manager of the Snow Hill and Crop Side pits of the Darcy Lever Coal Company, near Bolton, Lancashire, before coming to South Africa in 1893. While working as a fitter at Geldenhuis Deep, Johannesburg (from 1896), he obtained the Transvaal Overseer's Certificate in 1898. The next year he became a mine captain at Geldenhuis Deep. During the Anglo-Boer War (1899-1902) he served with the Ambulance Corps in Natal for some time and later held a commission as Captain in the Witwatersrand Rifles. In 1904 he acquired the (Transvaal) Mine Manager's Certificate and became an assistant mine manager in Barberton for the Albion Gold Mining Company. That same year he was promoted to manager of Rose Deep, Ltd., Germiston. In 1907 he became mine manager at South Nourse, Ltd. (at Denver, Johannesburg). Following an amalgamation of mines he took a lengthy holiday during which he studied mining conditions in various parts of Europe. Upon his return to the Witwatersrand in 1909 he was appointed the underground manager for the Transvaal Stope Drill Competition. By 1911 he was assistant manager at the Ferreira Deep mine in Johannesburg. Johnson was a member of the (British) Institution of Mining Engineers. In February 1899 he became a member of the Chemical and Metallurgical Society of South Africa (from 1902 the Chemical, Metallurgical and Mining Society of South Africa) and served on its council from June 1910 to his death in 1913. In July 1903 he read a paper before its members on "The ventilation of deep levels", which was published in the society's Journal (Vol. 4, pp. 44-51). Three later papers by him, published in the same journal, dealt with "White labour in mining" (1909, Vol. 9), "Further notes on Rand mining" (1909/10, Vol. 10), and "The efficiency of labour underground" (1910/11, Vol. 11). A well-know person at the society's meetings, he often and sometimes forcefully expressed his opinions on mining matters. He was an early member also of the South African Association for the Advancement of Science. He died from miners' phthisis and tuberculosis, from which he had suffered for some time. Chemical, Metallurgical and Mining Society of South Africa. Journal, 1903-1905, Vol. 4-5 and 1908-1913, Vol. 9-13. Obituary notices: Mr Thomas Johnson. Journal of the Chemical, Metallurgical and Mining Society of South Africa, 1913, Vol. 13(9), p. 423. South African Association for the Advancement of Science. Report, 1903, 1905/6, 1910, lists of members.